It may come as a surprise but phone sales continue to be relevant to this day. Even companies with a strong online presence will find it hard to completely eliminate phone representatives since many customers still prefer closing a sale through a call. The increase in mobile internet usage has also added to the resurgence of phone sales, especially with the high adaptation to click to call links. And since mobile internet is only growing and far from peaking, the surge in phone sales is expected to increase significantly in the coming years. 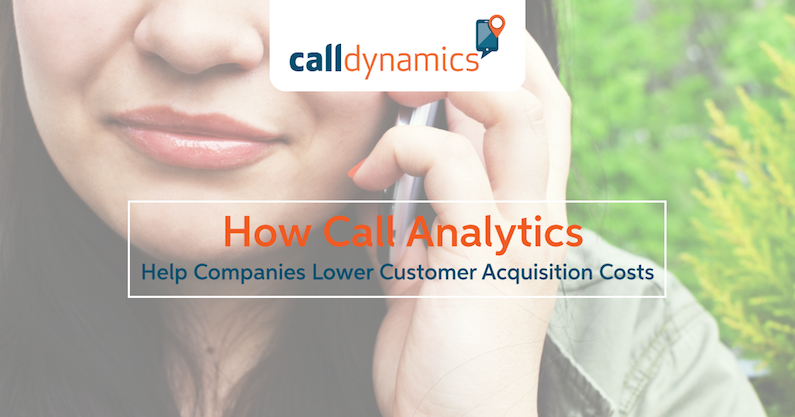 Before we discuss what call analytics brings to phone sales, let’s talk about Customer Acquisition Cost or CAC. CAC is the company’s cost to acquire a single customer. It is computed by the sum of all marketing efforts divided by the number of customers made for a specific period. So let’s say Company X spent $50,000 on PPC, $100,000 on radio ads, and $50,000 on trade events for 2016. As a result, they captured 1,000 new customers for the year. $200,000 in total marketing costs / 1,000 new customers = $200 CAC. It costs the company $200 to acquire each customer. In a nutshell, phone call analytics can help businesses lower their CAC by placing their marketing spend where it matters, and finding better leads and closing more customer sales through optimisation at every part of the customer journey. The right placement of marketing spend – by channel – can lead to savings by eliminating efforts that yield the least conversion and maximising the efforts that yield the most. Without call analytics data, marketing may not be able to attribute exactly where the leads are coming from, especially if multiple campaigns are running simultaneously (even PPC ads run in multiples). And this may result in marketers conducting campaigns based on gut-feel or guesstimates. Since marketing is expensive, taking that chance could be very costly. Finding better leads allows companies to spend less time and effort on convincing customers to proceed with a sale since they’ve already shown some form of interest to buy at the onset. The decrease in time and resources to close a sale improves a company’s ROI and allows a faster turnover of money that could be used to acquire additional sales for the same period of time. The more new customers there are, the higher the divisor of CAC equation is. The resulting CAC figure will then be smaller, considering the dividend remains the same. Scenario one: Call analytics could show that its radio ads weren’t generating any leads but its PPC ads were showing a 25% conversion rate. Company X could then opt to drastically reduce their radio ad budget and increase the PPC ad budget. A revised total budget for 2016 could be $5,000 on radio ads, $100,000 on PPC, and $50,000 on trade events. Assuming the customers are the same (1,000), the CAC would now be $155 – a significant decrease from $200. Two, call analytics could improve leads and shorten conversion time as a result of the improved marketing channel strategy. For the same ad spend in scenario one, let’s assume a 25% increase in customers was achieved. That would then be a $155,000 marketing spend/ 1,250 customers = $124 CAC. What have you got to lose? Recording your calls with Call Dynamics is quick and easy. Use our 30 Day Free Trial and see what it could do for your business.